Taste test: These are Wise's version of the popular Doritos nacho cheese chips. 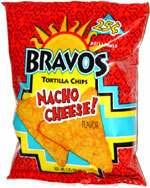 They had the same triangular shape as Doritos, but the Bravos were thinner, and I was surprised to discover that some of the chips in this bag had holes in them. This could be an problem if you wanted to use them for dipping. The taste of the chip was good, but it was generally much less cheesy than Doritos, so you taste more corn and less cheese. Smell test: A cheesy tortilla chips smell. OK.